Here is Your Summer Plant Care Guide! This guide will help teach you the proper watering methods for watering during a drought, and tell you approximately how much it's costing you every time you water! Weed Pro's Plant Drenching Treatment can Save Your Plants! Trees and shrubs thrive in a natural forest environment, where leaves and organic debris are free to decompose, creating an abundance of active microbiology in the soil. Weed Pro’s Holganix system helps to recreate this natural forest environment for your trees and shrubs by building up the microbiological life in and around your landscaping, which in turn helps promote root development and nutrient uptake. This creates healthier trees and shrubs, also drastically reducing susceptibility to disease and insect damage. 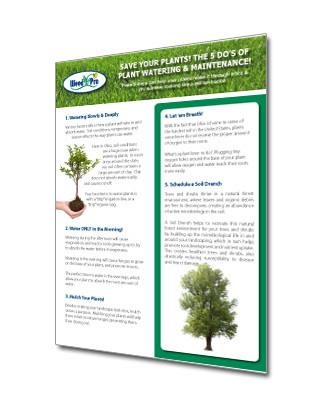 If you'd like an FREE ESTIMATE on our Soil Drench that can save your plants CLICK HERE.